Ferguson: 'They're Talking To People': Tensions Ease In Town Torn By Teen's Killing : The Two-Way Instead of meeting demonstrators with tear gas, police walked with them. Ferguson, Mo., saw more protests last night — but instead of meeting demonstrators with tear gas and armored vehicles, police walked with them, and posed for photos. 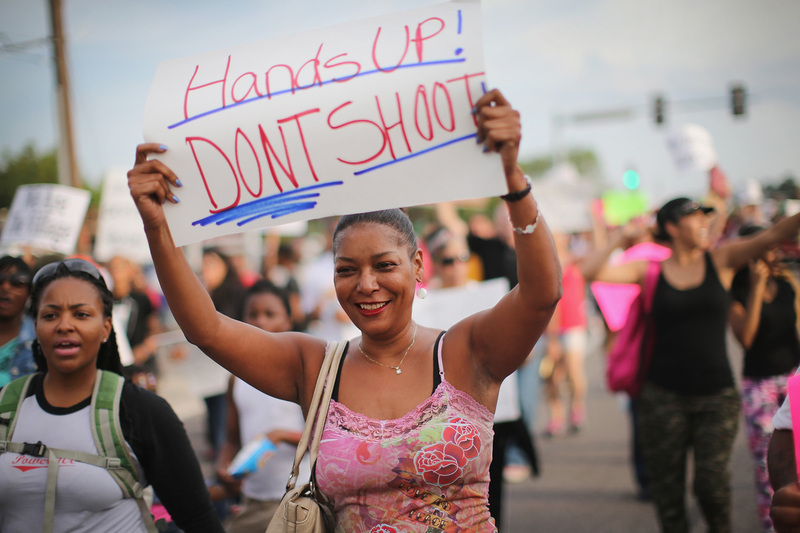 The shift came after days of clashes sparked by the police killing of unarmed black teenager Michael Brown. "There was no line of armored trucks or police in riot gear blocking traffic Thursday night. The few police officers spotted in the crowd were wearing regular uniforms. "Gov. Jay Nixon placed Missouri State Highway Patrol Capt. Ron Johnson in charge on Thursday afternoon, instead of the St. Louis County police. The result was an atmosphere that felt more like a party. "Protester Dante Kelly hoped the night was a tipping point. "Other protesters shared Kelly's skepticism that the change would be permanent. And many expressed their frustration that the police had not yet released the name of the shooter." The Missouri Highway Patrol, which has taken over security in Ferguson, says that no arrests of demonstrators were made Thursday, confirming reports of a peaceful protest. Capt. Ron Johnson said people, and the police, need to continue that trend. Protests against the police shooting and killing of teenager Michael Brown had a different feel Thursday in Ferguson, Mo. Police scaled back their military-style operations and instead walked with protesters. "In our anger, we have to make sure we don't burn down our own house," Johnson said. He also said he welcomed the use of cameras to record police work, saying that they "don't change our jobs." Johnson also acknowledged criticism of the way in which Ferguson Police Chief Thomas Jackson released the name of Darren Wilson, the officer who shot and killed Brown, 18. The chief did not take questions, and he added new information about last Saturday, including the news that Brown was suspected of stealing cigars from a convenience store about 10 minutes before he was stopped. The investigation into Brown's death is continuing, and on several fronts. Soon after the shooting, Jackson asked the St. Louis County police to handle the inquiry; the FBI and Justice Department are also conducting their own investigation. But the key difference in Ferguson on Thursday was that police had changed their approach to trying to prevent a repeat of the violence and property damage that occurred Sunday. Police were heavily criticized for using tear gas, deploying heavy weapons and arresting journalists. "They made it look like they were over in Iraq, ready to attack us," protester Marquess Mull tells NPR's Cheryl Corley. But Thursday was different, he said: "They're talking to people." The new commander, Johnson, is a Ferguson native who is also black. He and Jackson had both said police would change both their tactics and their appearance in an effort to avoid provoking protesters. The military-style gear and the gas masks would be stowed, they said. "When we talk about boots on the ground," Johnson said at a news conference Thursday, "my boots are going to be on the ground. And so we are going to have a different approach and have the approach that we are in this together." Johnson kept that promise last night, walking with demonstrators, hugging people, and representing authority in a way that's been absent this week. The community responded with a spirited demonstration that was marked by cheers and the honking horns of passing cars. One woman told Johnson, "Thank you so much for coming out here tonight," according to The Washington Post's Wesley Lowery. This week, scenes of grief and confrontation in Ferguson have further stoked racial tensions in the town that's two-thirds black, and the images and stories have resonated far beyond the town. In a show of solidarity, thousands of protesters in New York, Washington and other cities held their own demonstrations last night, chanting the phrase that has rung through Ferguson's streets this week: "Hands up, don't shoot," a reference to witnesses' claims that Brown had his hands up when he was fatally shot Saturday. In Ferguson, the new tone was indicated most simply, and perhaps most adorably, by a Thomas the Train parade vehicle that plied the same streets where armored vehicles had recently roamed. It carried a group of smiling young men.